I think Attack of The Unsinkable Rubber Ducks is a mixed bag. It's one of Chris' funniest books—you can't expect less when anyone, let alone Chris Brookmyre, talking about woo-woo psychics and the likes. Jack is much less of a pr*ck, what with being inside and involuntary cannibalism, not to mention being dead, should at least do something to his character. And Michael has restored my faith in geekdom. The whole debunking stuffs are funny and very informative. It's just it wouldn't happen. I mean the idea that someone can set a university chair without anyone bother to check the proposed scholar's academic record sounds really stupid to me. It would work only in pre-Google-Scholar, heck, probably in pre-Google time. Even then they should have phones, right? But yeah, the story wouldn't work otherwise so I let Chris get away with this one. The other thing that gives me mixed feeling is throwing in psychic stuffs (talking to the dead, telekinesis, mind reading and the likes), pseudoscience (homeophaty), and religion in a, well, mixed bag. I understand that the first two are intertwined. I'm not sure about the latter because in my understanding of my religion, the faith in the latter should negate the belief in the first two. Yeah, we do believe in the afterlife, doesn't mean we can call them up any time we want via the supernatural hotline. So, I never see it as such a big deal. It's probably a big deal in the US, but not in Indonesia where everyone is—supposed to be—religious. Except the reason why it's not a big deal in Indonesia is because it's already taken for granted. And maybe it is a big deal after all, I just don't look close enough. Indonesians are known to be superstitious, and for some it doesn't seem to conflict with their religion at all. On the other side of the spectrum, this guy used to be (or probably still is) quite famous among students, even in the best universities in the country. 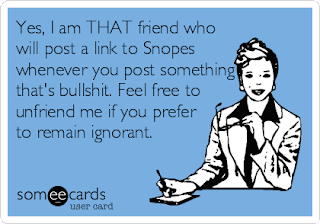 In regards to pseudoscience, I need not look further than my facebook newsfeed where some people fail to consult snopes.com, indeed maybe don't even aware of its existence. how come snopes doesn't have an entry on 'hipster'?